Greece's Finance Minister Euclid Tsakalotos, left, speaks during a news conference as Economy Minister Giorgos Sathakis listens, in Athens, Nov. 17, 2015. Greece reached an agreement with European creditors Tuesday on economic measures it needs to make so it can get its next batch of bailout money, including a $10.7 billion cash injection for its crippled banks. Though the government of Prime Minister Alexis Tsipras had already made a number of the reforms required by its third international bailout, it balked at a few, notably a law making it easier to evict people in arrears on their mortgages and measures to reduce the burden on banks of bad loans. But Pierre Moscovici, the European Union's top economy and finance official, said Greece and the creditors had reached a deal on all outstanding issues -- a development that also brings promised discussions on reducing Greece's debt burden one step nearer. "I am happy to confirm that agreement has been reached on the remaining measures needed to complete the first set of milestones," he told a press briefing in Brussels, without providing details on the reforms. "We expect finalization of the process to take place shortly following the swift adoption of necessary legislation by the Greek Parliament on Thursday," he added. Once Greek lawmakers approve the measures, Moscovici said the institutions that oversee Greece's bailout program will assess Athens' compliance, paving the way for the cash disbursements. "This is a good day," Moscovici said. Jeroen Dijsselbloem, the eurozone's top official, hailed the "good news" of a "substantive agreement" between Greece and the institutions overseeing its bailout. 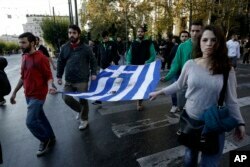 University students hold a blood-stained Greek flag from the deadly 1973 student uprising in Athens, Nov. 17, 2015. Thousands of people marched to commemorate a student uprising that was crushed by the country’s military regime in 1973. Under the three-year bailout, Greece has to meet a series of targets and reforms to get money -- from opening up rigid professions to the pricing of pharmaceuticals. Confirmation that it has cleared its latest hurdles means Greece should get 2 billion euros in loans to shore up its depleted public finances as well as 10 billion euros for its banks, which are reeling from limits on money transfers and another likely recession. Healing the banks is perhaps the most pressing concern for Greece. The lenders remain badly hobbled by this year's crisis, which put the country on the brink of falling out of the euro. They need cash quickly so they can start operating normally -- a necessary condition for any modern economy. The scale of the problems facing Greek banks is most evident in the fact that the government is still limiting cash withdrawals to a paltry 60 euros a day or 420 euros a week. The limits were imposed in late June to head off a bank run. Last month, the European Central Bank said Greece's banks need 14.4 billion euros in fresh money to get back on their feet and resume normal business. The banks are unlikely to go back to business as usual immediately after the cash injection: limits on money transfers can take a long time -- even years -- to be lifted completely. The sum that the banks will get is lower than many had anticipated. Up to 25 billion euros was made available in the bailout program. As a result, the size of Greece's third bailout should turn out to be smaller than the 86 billion euros envisioned in the summer. The bank recapitalization has to be completed by the end of the year as new rules are set to be introduced in 2016 that mean depositors with over 100,000 euros in a bank will have to contribute to the banks' rescue. Greece has relied on bailout funds from its eurozone partners and the International Monetary Fund since the spring of 2010 and is flirting with another recession. Once the promised reforms have been passed and the bank recapitalization has taken place, discussions between Greece and its creditors can move on to how to lighten Greece's public debt load, which after the anticipated recession could rise to around 190 percent of the country's annual gross domestic product. Though outright cuts to Greece's debt have been ruled out, the country could get help through longer grace periods and lower interest rates.